The date Nov. 10, 2008, likely doesn’t ring much of a bell for most Richmonders these days. But for the group that gathered last week at Hardywood Park Craft Brewery, the fateful Monday 10 years ago still carries weight – at least enough to give them a reason to party. Around 250 former Circuit City employees gathered Jan. 31 for a reunion to commemorate the collapse of the once-mighty Henrico-based electronics retailer. It was on that date in 2008 that the company fell into bankruptcy, where it still languishes today in a seemingly perpetual Chapter 11 case. And while lawyers continue to fight over scraps in bankruptcy court a decade later, the company’s alumni were hugging, reminiscing, catching up and dusting off at least one old red Circuit City fleece jacket circa 2002. 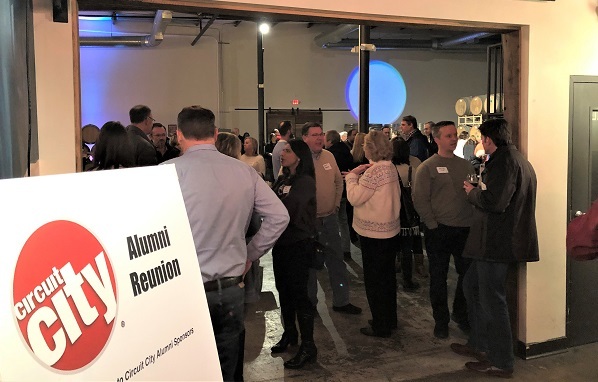 The event was organized by Dawn vonBechmann, a former Circuit City senior vice president who worked at the company from 1986 until the collapse. The event was organized by a former Circuit City senior vice president. She said the party was prompted by the fact that a lot of former colleagues have stayed in touch through the years. She reached out to Sheri Crowell, who runs Sunnyflower Events, a local event-planning company. Crowell’s husband also is a Circuit City alum. Word went out on social media and eventually, 250 people were excited enough to pay $20 each to attend. Some even came from out of town. An oddly close way has helped maintain ties for many Circuit City alums. 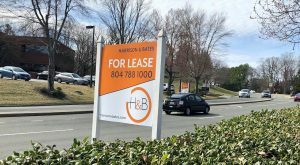 VonBechmann said small packs of coworkers from the company ended up working together again in similar capacities at other companies, including McKesson, Southern States, WestRock (formerly MeadWestvaco), Lumber Liquidators, Petsmart and Advanced Auto Parts. “There are a lot of those people who still work together,” she said. “The Circuit City connections really do run deep. Bill Cimino, who worked as head of Circuit City’s investor relations and corporate communications, said the group formed a long-term cohesiveness by going through a tough time together. “A lot of us had a shared experience and really enjoyed working there despite the challenges it had,” said Cimino, now head of investor relations at locally based Union Bank & Trust. “But also going through the bankruptcy process tends to build camaraderie. 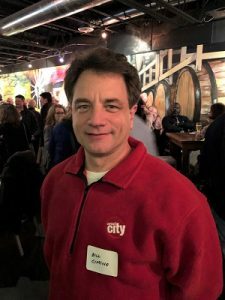 Cimino, who showed up at last week’s party sporting his still-bright-red Circuit City jacket, said he was one of the last 70 employees who stayed on to help wind down things. As for the seemingly never-ending Circuit City bankruptcy case, there does appear to be an end in sight, albeit a moving target. Andrew Cain, an attorney with Los Angeles law firm Pachulski Stang representing Circuit City’s bankruptcy trustee, said he expects the case to wrap up this year. He said the same thing in November 2017, but said they are still working to dig up additional money to pay back to creditors, who have received 53 cents for each dollar owed. Circuit City had 17,000 creditors with debt claims of $1.2 billion when its liquidation began. 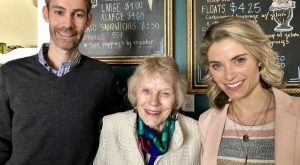 While the longevity of the bankruptcy did give vonBechmann and her friends a reason to have a party, she said she also has seen at least some payback from the process. “I was a creditor and once in a while, a check shows up,” she said. 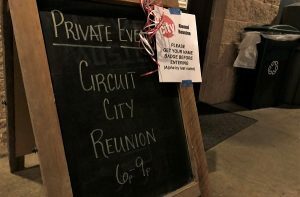 6 Comments on "Former Circuit City employees party like it’s 2008"
This piece nominated for the best ever Story Title. Nice work! This is just a reminder that MBA’s shouldn’t make the decisions for a retailer. That was the beginning of the end for Circuit City. White goods were eliminated because they didn’t have high enough margins . That caused loyal customers to shop at competitors. The white goods inventory was sold at bargain basement prices, to make way for compact discs (CD’s).It was a downward spiral from there! Does anyone remember the horrible E-bay debacle, bring you junk in we will E-bay it and give you cash. Hey what do you mean no one bought my 350 lb Sony Console. BTW I do not want it back, thanks CC for helping me clean out my garage. Whoever came up with that idea was an idiot plain and simple. Also the White goods exit the WAY out of budget store remodels. So many bad decision by inept management just more than the brand could endure. 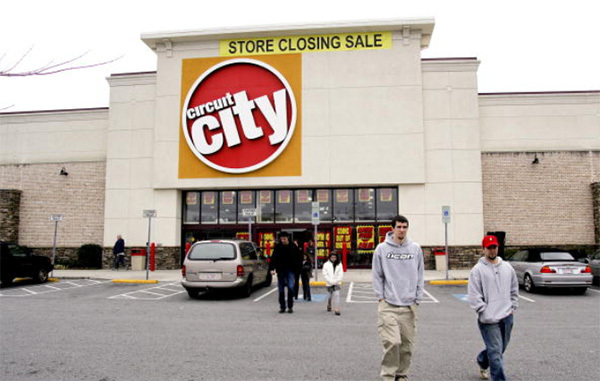 While there were many factors surely leading to the demise of Circuit City, one of the saddest was that the Richmond market simply didn’t support this hometown hero. I remember talking to several friends trying to explain how supporting CC was about the larger RVA ecosystem but in the end-most don’t care u unless they are impacted. Shop Local when possible!